Exquisite Life Like Wooden Indian At A Fraction of Appraised Value. Hand Sculpted in old tradition (NO CHAINSAWS USED) Klin dried to prevent cracking. Wooden Indian Wood Cigar Store Warrior Scout LIFE SIZE 8"
This beautiful Indian has been kiln dried in a huge oven, and it will not crack. You can see how the antique finish appears in the lower pictures with the color applied. We will show pictures of several of our carvings so you can get an idea of what is possible. We will finish your Indian just as you like it. You may have the color bright, soft, antiqued, natural or a combination of color and technique. We can do school colors, finish for indoors or even outdoors. This is an amazing work of art is hand carved with intricate detail. The pictures don't do justice to the rich color and intricate carving. The antique finish requires many, many hours of sanding, applying finish, waxing, buffing then removing it just to start all over again. This process happens many times resulting in an inordinate amount of time spent. There is no quick way to do this and have it look right! Before the carving can occur, the wood must air dry for a minimum of 4 months then basic rough carving can occur . Next the wood is kiln dried to force crack the wood. After the cracks are repaired, the final carving can begin. After detail carving and sanding, the patina work can begin. Some sections of the carving an have up to 20 coats of finish to achieve the desired effect. We put on the finish then take it off then put it on then take it off, etc., etc. The unique Indian sculpture was masterfully crafted by hand from Chamjuri wood. Traditional mallets and chisels are used; no chainsaws here! 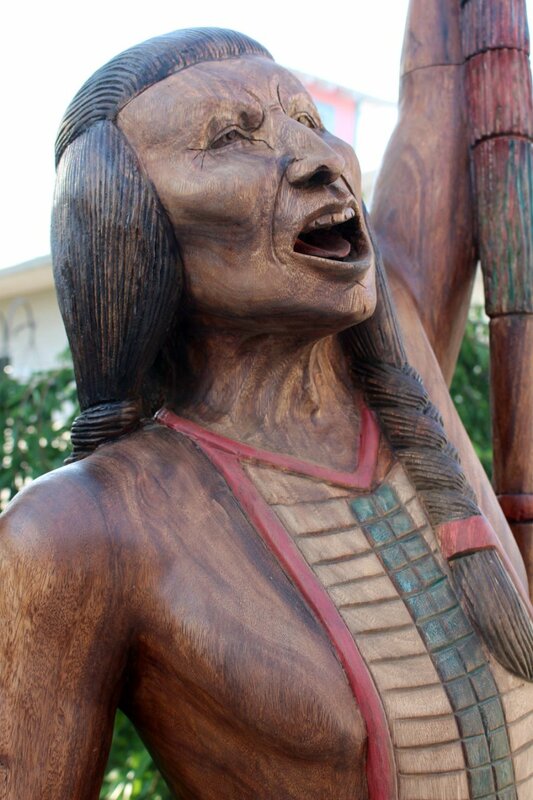 Unlike other wooden Indians you may have seen, this one looks very realistic. This Indian weighs approximately 200 lbs. I use uShip for the shipping. drivers bid for the shipment and is normally from $200 to $500 depending on the distance. UShip is white glove service to your front door. During the 19th century, tobacconists frequently displayed carved wooden Indians to attract patrons into their stores. Until recently, a great mystery surrounded the history and origin of Cigar Store Indians, Wooden Indians, Shop Figures and Wood Statues that are a part of American folk sculpture. 50% deposit required to get in queue; delivery is usually from 2 to 3 months. Please note that we will deliver your completed Indian masterpiece in order of payment. It would be wise to get in queue if you want one in the near future.